Back in the day, the PTUA ran a campaign called “Problem Of The Day“. It highlighted a basic problem on the public transport network each week, by a way of a photo or a video. It was a good way of highlighting that many of the issues are not those that require billions of dollars to fix, but could be resolved with relatively little money and more thought from authorities as to how the system works for passengers. Eventually it ran out of steam because the supply of good photos dried up — though perhaps the idea should be re-visited. Anyway, in that vein, the two photos below are from a recent trip to Shepparton. Can you spot the problem here? Hint: it was not a once-off problem. Update: Marcus got it. The bus network maps, web site and bus stops, all show route numbers. It appears none of the buses do. Why is this important? Well if the buses aren’t showing the route numbers, why bother even having them? And given that according to the map both routes 7 and 6 run from Shepparton Marketplace to “Shepparton” via different routes – if you’re waiting there or along Benalla Road and you see a bus going to “Shepparton” (but you don’t want to go all the way to the terminus), how do you know which route it’s on? Next → Next post: So, is this a zebra crossing, or not? Can’t think of any issues. 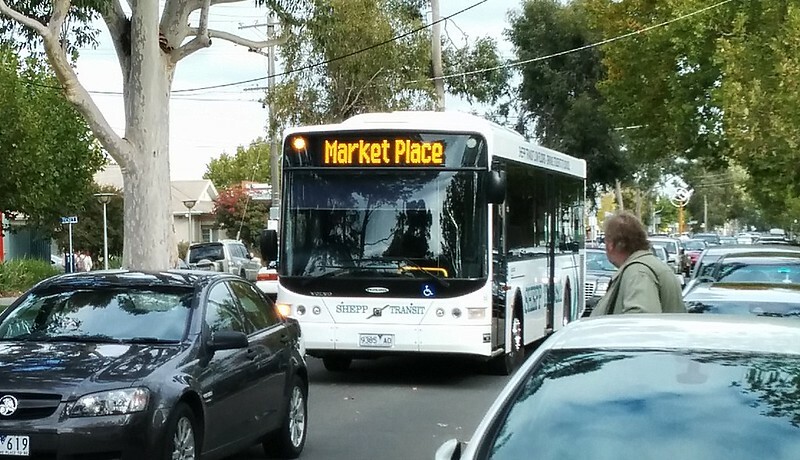 I notice that Market Place is written as two words on the bus display but only one word on the sign. Could that cause a problem with patrons doing google-type searches? Is there a map? (Where does the bus go)? How frequent is the service? (Should I walk instead)? Are the cars parked in the bus stop? @Roger was warm, but @Marcus got it: the bus stop signs all show a route number (as does the web site), but it seems none of the buses have them. It appeared to not be a problem unique to this route, but for all bus routes in the town. Yep, Marcus has hit the point. No route number shown on the bus. Almost as bad as Sita bus lines and the fact they do not change the destination signs at each end of the route. Does PTV not have much say in what the bus operator displays on the front of the buses? Surely the PTV can give a directive to the bus operator to say ‘You must add the route number to your bus destination signs!!!!!’. They have exactly this problem in Newcastle, NSW. Some of their buses run to “Marketplace”. Which is one of their suburban shopping centres, but I have no idea which one. They change their names regularly. They should use the name of the suburb. Those don’t change, and people know where they are. I didn’t know that Shepparton is the seat of a Duke. With the urban buses in Geelong, Ballarat and Bendigo, buses to the outlying terminus display a destination and number, i.e. 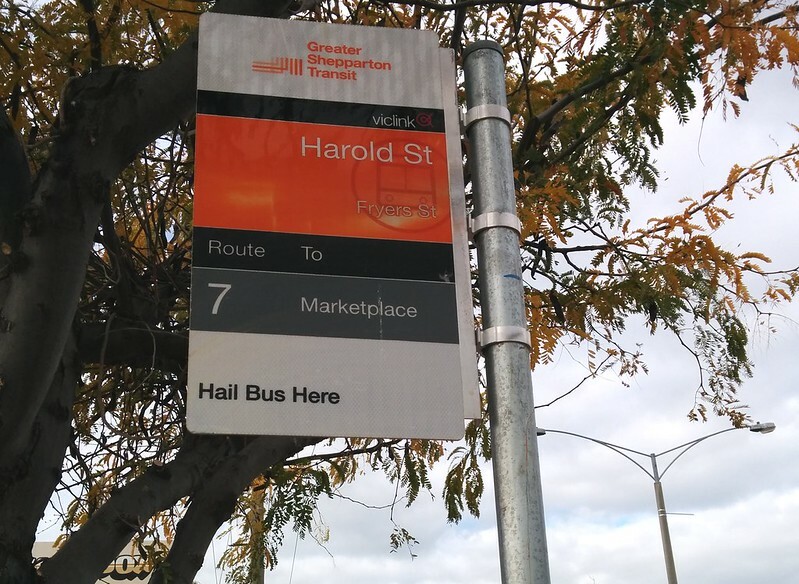 “Corio 10”, but inbound trips display only “CITY” on the desto, or “CITY – STATION” in Ballarat for a bus going to/via the train station. Given that there are stops serviced by multiple routes, are they assuming that nobody at all would ever want to make journeys within the suburbs of regional cities and might like to know which route it goes via? Same thing happens on routes 493, 494, 495, 497 which most of the time don’t display a route number, just “Williams Landing”. But only in that direction. Then you got buses in Wodonga, where the number displayed on the desto is not the route number.